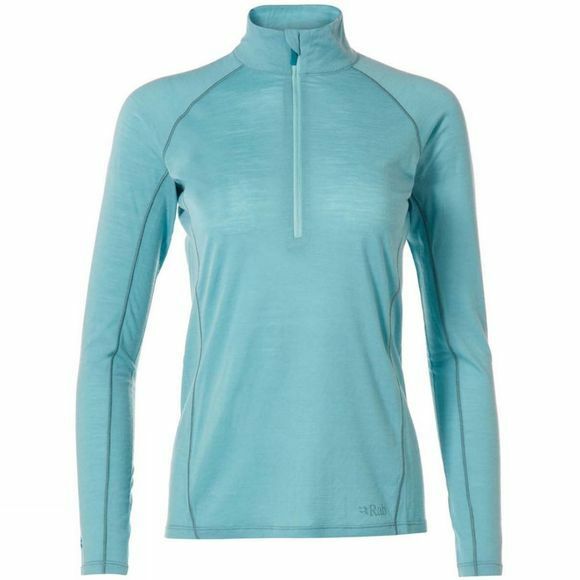 Keeping you feeling comfortable for longer while enjoying the outdoors, the Rab Women's Merino+ 120 Long Sleeve Zip Top is a lightweight base layer combining warmth, wicking, rapid drying and odour resistance, making it suitable for multi-day adventures in variable conditions. Rab's Merino+ fabric is a mix of Merino wool and polyester with Cocona 37.5 technology. Merino wool is excellent at keeping your body temperature at a comfortable state as the temperature and your activity level changes. Polyester enhances the resilience of the fabric, and makes it easy to wash while the activated carbon added to the fabric by Cocona's 37.5 technology radically increases the surface area of the yarn so that sweat spreads rapidly across the fabric to accelerate evaporation and drying time.